The title of the article tells you one of the reason why bone graft is done. 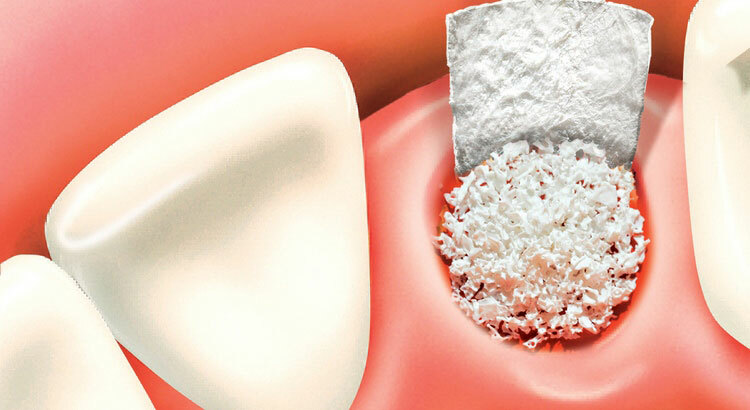 The main scope of bone grafting procedure is to add hard tissue to support dental implants. Let’s say you want to replace your missing teeth with dental implants but you don’t have enough bone. What is the alternative ? You do not need an alternative. Your dentist can surgically add bone to your jaw. Do I need bone grafting before dental implant ? If you want to go with dental implants, you must have enough bone in your jaw. This is the most important requirement to check before to proceed. Dentists place the implants into your jawbone. So, the better the bases are, the higher chances for your implants to be fully integrated into your jawbone. Height. Your gum must be tall enough to insert the implant. Density. It depends on your DNA. Bone quantity and quality often is not a problem for patients who have only recently become edentulous. Long-time denture wearers often have too small or thin ridges for implant placement. The topic is not easy. I will describe you step-by-step how oral surgeons or periodontists (perio.org) do bone grafting. In this way it will be easy for you to get the whole picture. The block bone procedure is useful when you need a large amount of tissue. This process is done to create the right support for your dental implant. It is a block of hard tissue that is placed to replace the missing one. Where is the block bone graft taken ? Usually the block comes from the chin or the lower jaw. But, it can also come from the hip or even from your tibia. Your dentist will remove a small block of hard tissue and transfer it to the target area. The material for grafting will be placed at the area that needs bone augmentation. To keep the new material in place, the dentist will use titanium screws. The grafted area will be covered by a collagen membrane during the healing time. After four to six months. the titanium screws will be removed. It is not painful at all. Now you are ready for the implant procedure. Are you happy ? I’m kidding. This is a common procedure when teeth were extracted without any bone grafting. Gum infection or tumors can also destroy a large part of your jawbone. Sinus Lift or sinus elevation is the procedure to add bone the upper back jaw area before dental implant placement. When the back teeth (upper molars and premolars) are missing the sinus cavity becomes larger. If the dentist places the implant in that condition, the failure possibility is very high. The sinus lift procedure involves adding bone below the sinus so that implants can be placed. You already know that your ridge must be tall enough before to get implant. This is not all. The ridge must also be wide enough to support dental implants. To accomplish the ridge expansion, you dentist creates a small space along the top of the jaw. The bone graft material will fill that space. In some situations implants can be placed right after a ridge expansion. Like all grafting techniques seen so far, ridge expansion helps to create a strong base for your new teeth. Periodontal diseases go from simple gum inflammation to more serious disease. When gingivitis is not treated, it can advance to “periodontitis”. This more serious gum disease creates space between the tooth root and the gum. Bad guys start to break down the jawbone and the gum tissue that hold teeth in place. If not treated gums and tissue that support teeth are destroyed. The teeth may become loose and have to be removed. Bone graft after periodontal disease helps your natural teeth to stay in place. Do you need bone augmentation because of gum diseases ? Your dentist can solve the problem with two graft procedures. it means to surgically reshape the tissue that has become altered by the disease process. The goal here is to give it a more normal form. Thus, it allows the treated area to heal normally. Bone grafting or Block bone graft procedure. it happen by placing replacement materals into holes caused by the disease. It works like a skeleton. The body start to generate new natural bone on it. In case you need a large material quantity, your oral surgeon has to go with the block bone graft procedure. It means that a piece of your own hard tissue is anchored and kept in place by titanium screws. After the healing time the added bone fused with your own and the dentist can remove the screws. How to pick the best grafting procedure ? Your periodontist has to evaluate the amount of jawbone destroyed by the gum disease infection. If it is a small quantity, the normal bone graft procedure is ok. For a larger area the “block” technic Is better. In this case, the goal is not to place an implant. The scope of the graft process is to preserve your own tooth giving it the right support. You may think that the listed procedures are painful. Believe me, they are not. It is a standard job for almost all dentists. Let’s go on with the reasons why you may need bone graft. Along the article I’ll describe you where the material is taken and how. Bone graft after tooth extraction. Why do I need it ? The tooth extraction leaves a hole (or socket) in your jawbone. The only purpose of the bone is to support the tooth. Because the dental element is no more in place there is no reason to keep it. When the tooth is no more in place the body begins to resorb the hard tissue. The dentist can stop that process by replacing it with either another tooth, implant or a “ridge preservation graft”. Occasionally, it is possible to place an implant immediately after the tooth extraction. The implant works almost like a natural tooth. In this way bone do not start to reabsorb. What if the doctor cannot place the implant ? In the second case your dentist will go with a bone graft after tooth extraction. The augmentation works to preserve the ridge. The ridge graft procedure fills the void left by the extracted tooth. It also holds the volume of this space. Meanwhile the natural bone grows and fills the space with high quality new hard tissue. The ridge graft requires three to six months before an implant can be placed. It depend on the size of the extracted tooth. Most bone augmentation procedures require the surgeon to use bone grafts technics. The first choice is your own tissue. In this case the replacement material come from your chin or ramus (the back part of your lower jaw). If your dentist need more material, it can come from your hip or tibia. The hip can provide a generous donor area. However bone taken from your hip requires a hospital stay and general anesthesia. There are people that don’t like the idea to get bone removed from their body. Your dentist can use materials made from the bone of human cadavers or cows. I know, it is strange to get bone from cadavers. If you don’t like this idea, the third solution may solve the problem. Synthetic bone, like Bio-Oss, is the new material for bone grafting. How does it work ? These materials push some cells of your body to produce new jawbone tissue. As you can see, there are many options available. Of course you cannot make a choose by yourself. You should ask your dentist for risks and benefits before to take a choice. How much does dental bone graft cost ? There are many bone grafting procedures so even the prices are different. I will list each single procedure and its cost. In this way you will have an idea of the amount of money you need. The most simple graft with bone from cadavers or bovines or synthetic bone may cost $200-$1,200 per dental implant. The price increases if your own tissue is needed. In this second case the doctor has first to take the material from one spot of your body and place it in another one. You need to undergo two different operations. That’s why using your own body material the cost is bigger. Generally from $2,000 to $3,000 or more. I know, it is not so cheap. Keep in mind that in the first operation an orthopedic surgeon and an anesthesiologist are involved. In addition, the procedure requires admission to hospital. At least one day. Does insurance cover the bone augmentation cost ? When we touch this topic you may notice that a little detail makes a lot of difference. Let’s distinguish between dental and health insurance. I will do that by a few examples. Dental insurances may cover a part of the bone grafting cost if it is “medically necessary”. If you lose your bone due to accident or injury it’s a different situation. In this case the bone graft will be covered by a general health insurance. The reason is simple. It depends on the condition the patient is in. Let’s think about a person who is not able to eat in the normal way. Put the dentist cannot fix that problem with a normal denture. How is the life quality of that person ? Very bed ! In this case dental and general health insurances may cover the grafting costs but not the implant cost. Yes ! Bone augmentation may fail. Why ? The bone augmentation success rate is very high. In some cases the added hard tissue doesn’t merge with your own one. It is not because where the replacement material is coming from. It is because your general health condition. Smokers have higher risks of graft failure. Before any therapy, your dentist has to know about your health history. Tell him or her your daily habits and medicines you take. Bone grafting is not without risks and complications. Even if they do not occur so often. As for all other oral procedures there are side effects. I’m going to list the most common. In any case, keep in mind that your doctor should be available in the next 24 hours after the operation. Just in case. Though antibiotics, you may experience infection. The most important bone graft infection symptoms or signs are: redness, pus, pain and in some cases fever. If that happens, let your dentist know as soon as possible. Sometimes you only need to continue antibiotics for a second or third round. Each person reaction is different so it is difficult to write tips that work for all people. nerve injury or damage. It happens very rarely. ear pain. You may feel pain close to your ear especially when the very back teeth are treated. Within the first day the pain should go away. bone infection after tooth extraction (even after wisdom tooth removal). Before to place the grafting material, the hole or socket leaved by the tooth has to be clean. If not, the infection may start to work again. The first 24, 48 hours after dental bone graft procedure are the most critical. Stitches are just in place and you may experience pain. Swelling and bleeding are normal. I will write here some tips to help you to face the first two days after the operation. Ice packs should be applied on or around the treated areas. Especially over the eyes and cheeks. This will decrease the amount of swelling, bruising, and pain. Sleeping position. Put a few pillows behind your head and back for the first 1-2 days after bone graft surgery. Avoid chewing directly over the operated area until the sutures are removed. If your sinus was involved in the procedure, avoid to blow your nose. Avoid lifting the lip to look at the area. It may happens to tear the sutures and open the incision. Do not smoke after surgery. Take your antibiotics and pain medicine as prescribed. Do not exceed the quantity. Go back to the dental office to remove the stitches. Avoid to brush the operated area during your home dental care.